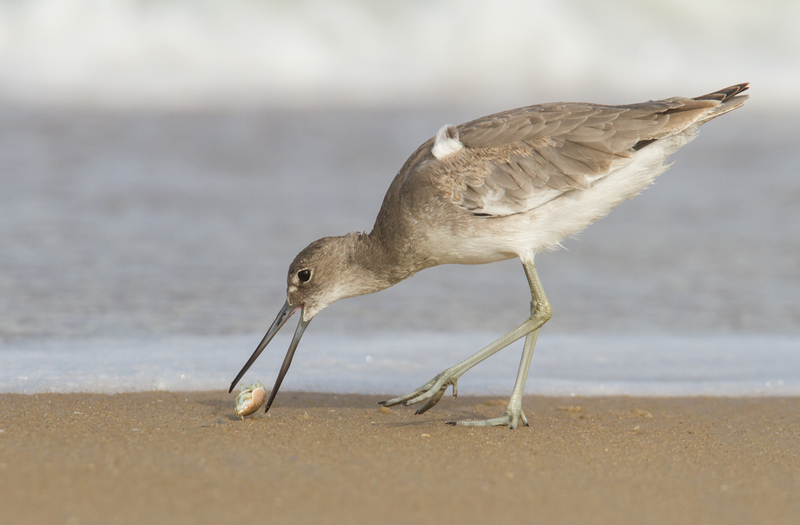 It is important to share the shore with shorebirds and respect their needs. Their lives depend on it. This time of year, the beaches of North Carolina are breathing a sigh of relief as the huge tourist crowds of summer are starting to thin. They are also seeing lots of activity from wildlife, both on land and in the surf. The characters are changing daily as migrating birds, butterflies, fish, and other coastal creatures make their way to their winter destinations. 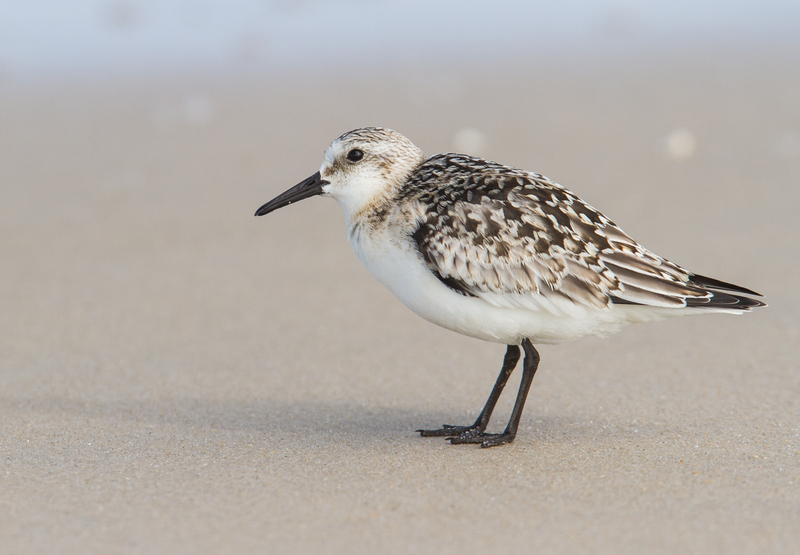 But, on almost any beach in autumn, you are likely to see a couple of standard shorebirds – Sanderlings and Willets. 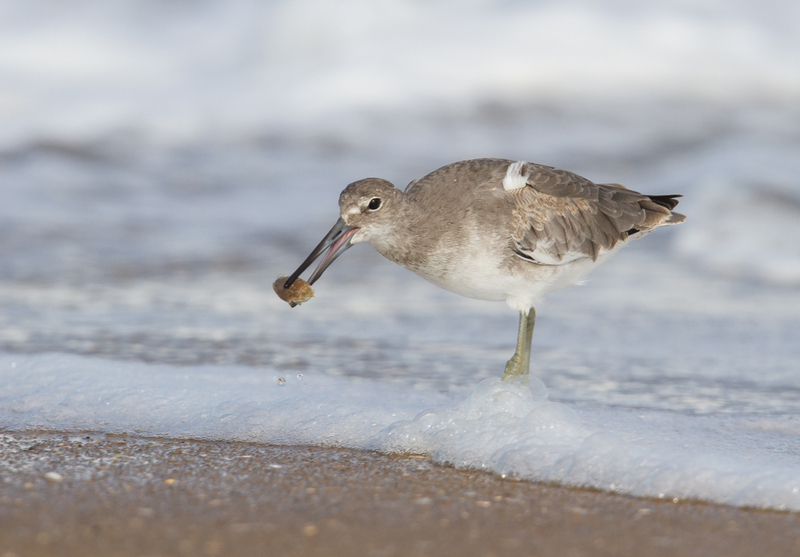 The former are the wind-up toys of the shorebird world, rapidly running to and fro along the surf line in search of morsels exposed in each wave, and squabbling over the right to do so. 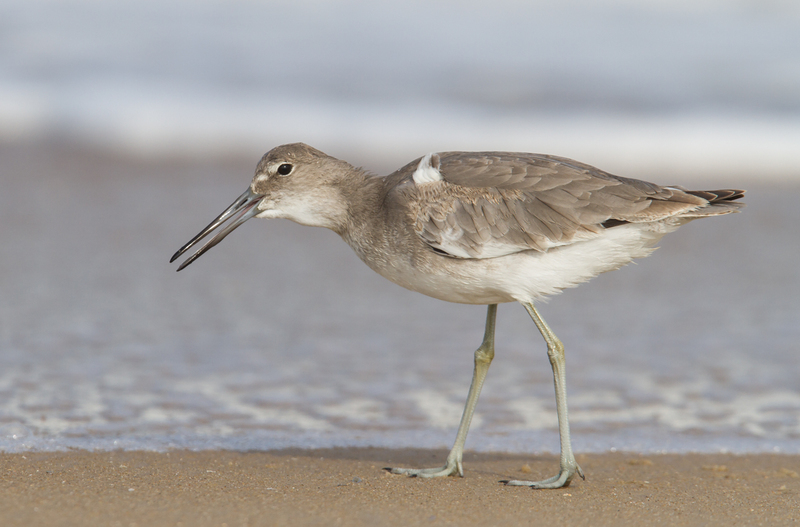 The more stately of these two shorebirds, and one of our larger species, is the Willet. 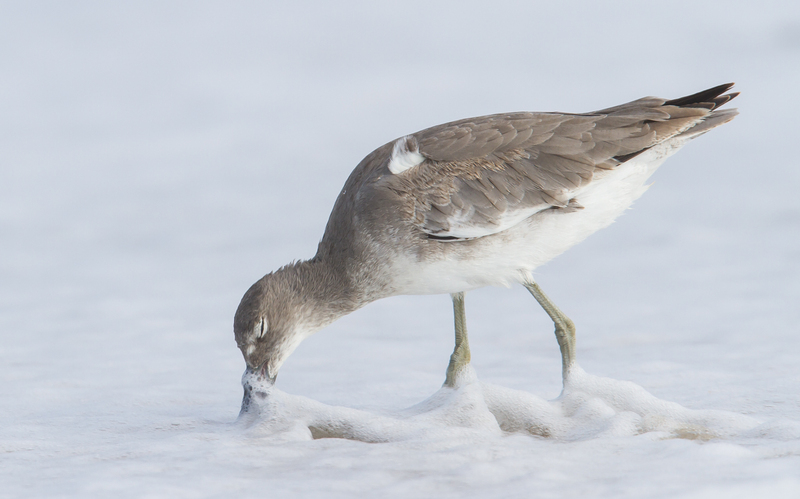 They are already in their winter plumage of drab gray above and a white belly (they are more brown during the breeding season). Since this one did not fly while I sat with it, I did not get to photograph their diagnostic bold black and white wing patterns, nor did I hear its piercing pill-will-willet call that is often given when they are in flight. 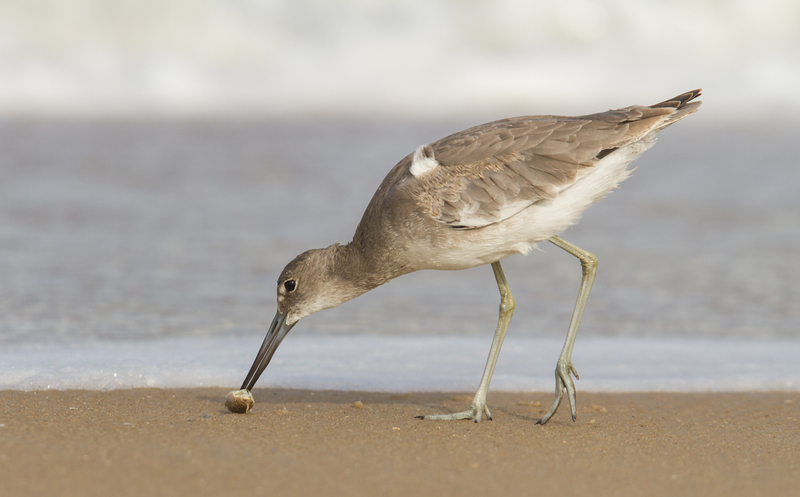 Willet, and many other shorebirds, were once rare north of Virginia due to market hunting. The Migratory Bird Treaty Act of 1918 banned this large scale hunting for food, and helped start a comeback for this now common species. New threats include habitat destruction and rising sea levels, and this combination may greatly restrict their access to suitable foraging and nesting areas in the future. 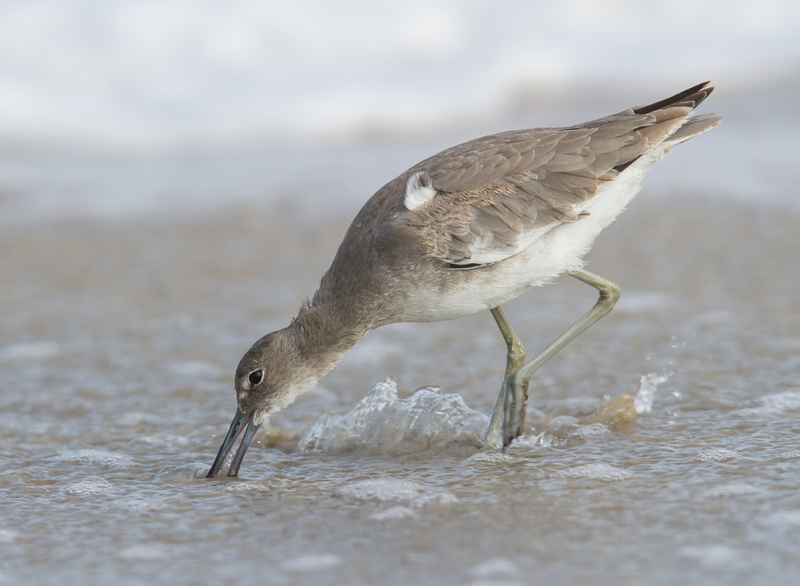 Willets use their long gray legs to stride up and down the beach in search of food. 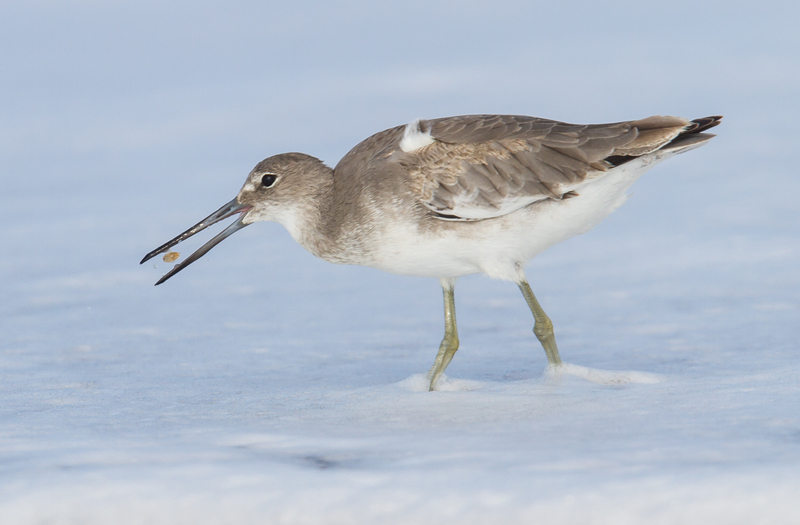 Their stout bill is used to probe the sand (or mud when feeding in marsh edges and mudflats). The sensitive bill tip can detect prey which is then quickly grabbed. 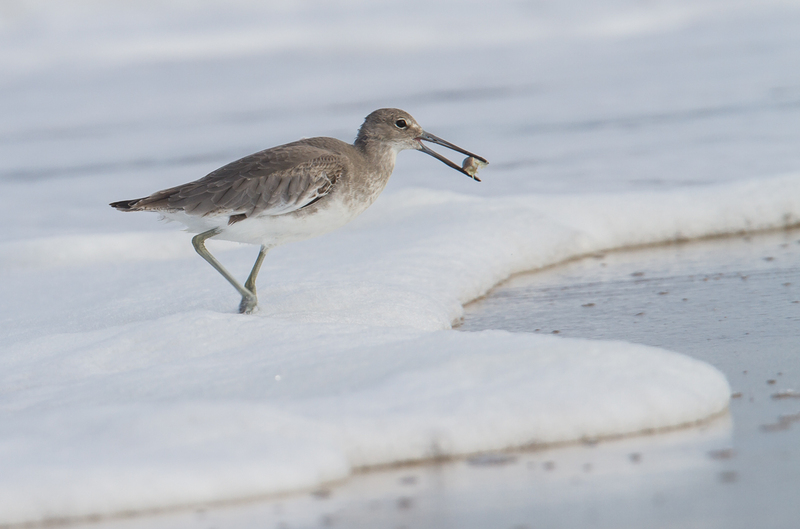 This also allows Willets to feed at night, when many other shorebirds, which rely solely on eyesight, cannot. Favorite prey items include small fish, worms, mollusks, and crabs. On this afternoon, Mole Crabs were the main course. A tiny Mole Crab was snapped up and gulped all in one motion while I watched. 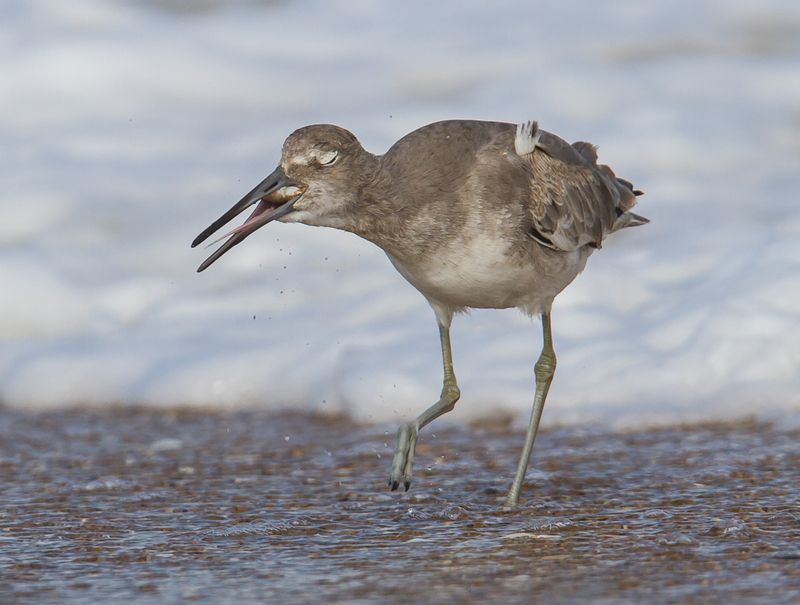 This particular Willet was quite adept at finding and catching the Mole Crabs as they surfaced to ride the wash from the surf back down the beach. 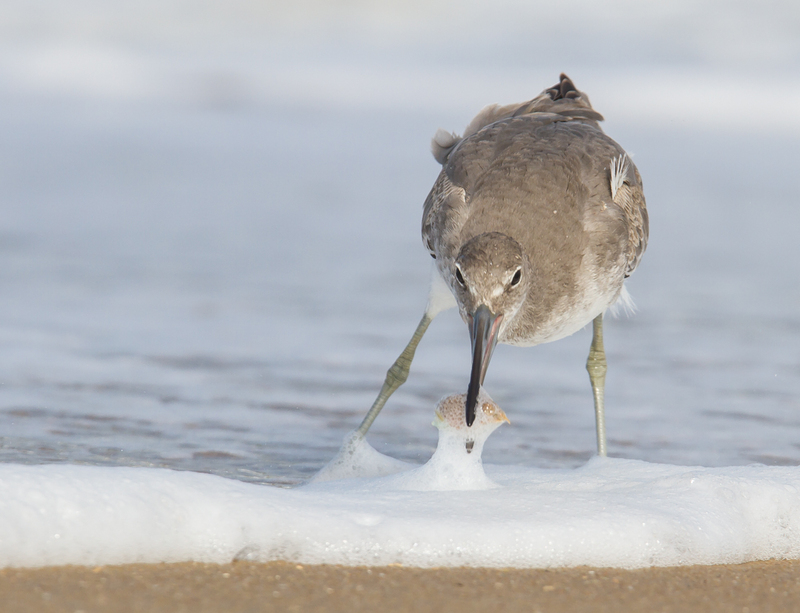 When it caught a large crab, the Willet would run back up above surf and drop it on the sand. and then the crab was picked it up and quickly swallowed head first. 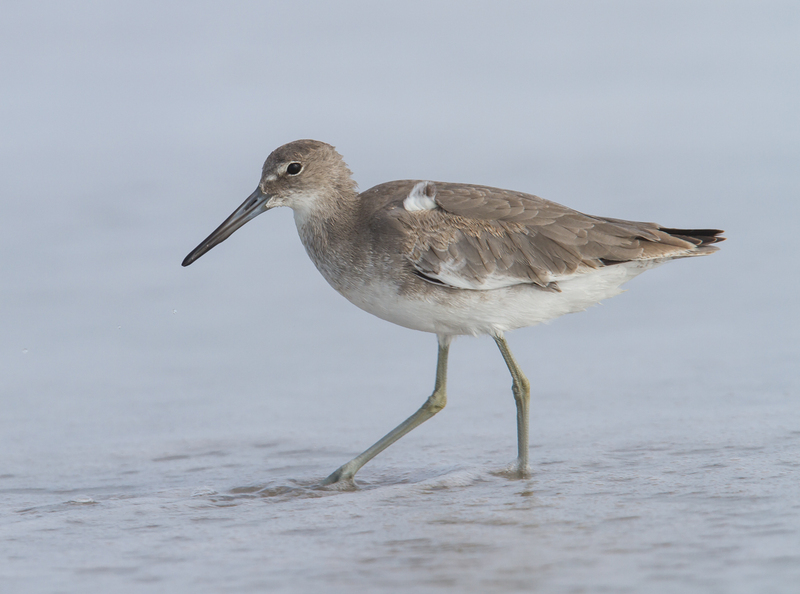 This entry was posted in Natural History and tagged mole crabs, shorebird, willet by roadsendnaturalist. Bookmark the permalink. I so enjoy your posts. Much appreciation! Thanks, Neesa, glad you do. I did…at my favorite restaurant on the OBX, Tortugas.